Get out the balloons and streamers because Dora and her friends are celebrating in this 3-DVD collection, Dora’s Big Party Pack. This fun series of party themed DVD’s includes Dora’s Big Birthday Adventure™, Super Silly Fiesta! and It’s a Party! My children’s favorite is the double length feature, Dora’s Big Birthday Adventure and The Big Pinata Surprise has inspired them to beg for a piñata for their own birthday party. There are lots of laughs, singing and dancing as Dora, Boots and a cast of familiar characters celebrate birthdays, a Quinceanera and a Fiesta. I appreciate that Dora the Explorer programming is wholesome fun for my little ones to enjoy. Nickelodeon™ is proud to release Dora’s Big Party Pack DVD collection on July 12th, 2011. With over 291 minutes of non-stop partying in 10 episodes, this is sure to be a hit for any Dora the Explorer fan and would also make an excellent idea for a birthday gift. 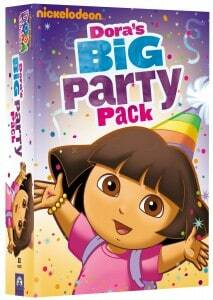 You can purchase Dora’s Big Party Pack, 3-DVD collection for only $17.99 by visiting the Nickelodeon website shop. Glad I saw this! My youngest turns two next month and has recently discovered Dora and Boots! She’s quickly become a fanatic! This will be great for her birthday! On a side note: I left the work world to homeschool my 8 yr old too!